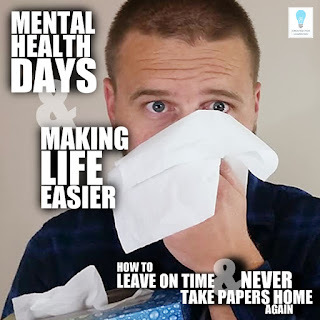 Today, we’re back with our series How to Leave on Time and NEVER Take Papers Home Again gonna crack open the topic of Pre-Sick Days and discuss how teachers should use them. How many sick days does your school give you this year? How many do they make you pay for? How many have you used? How many did you use last year? What did you use them for? Are you saving them all up for the end of your teaching career and retirement? Of course, they're called sick days for a reason, so you want to make sure you have enough of those when you need them. But we want to add a layer of ideas to the topic of sick days. My thoughts on this started one day when someone cracked a joke and said she was going to take a “mental health day.” I laughed, of course, but then got to thinking how great an idea that sounded. This idea might be something you already think about or it might be brand new. What do you think about using your sick days before you actually get sick so that maybe you won't get sick or worn down? 1st, let's get all the talk about retirement and maternity leave out of the way. In some states, you're unused sick days add up, and there's an incentive to not use them so they add up as paid retirement days or extra years on your years of service. If that's your goal, that totally makes sense. In this increasingly tough national teaching environment, we would ask you to consider if feeling less stressed and more rested might actually prevent burnout and get you closer to retirement? And if you're planning on having a child, take that into consideration for maternity or paternity leave. And now that you've thought about all that, then let's dive in. Ever feel like you're behind on your planning and it's wearing down your soul? Before you get actually sick, why not take a day every other month to plan ahead. Take 1-2 hours and reflect on the past weeks and how effective they've been. Make notes for next year. Take 1-2 hours to plan the upcoming months. Or if you did this last year, you get to upgrade last year’s plan. You might even pick some strategic spots in the year schedule for this planning day, so it can get you through the next part of the year. GRADING ...the never-ending monster! What if you planned 1 day a quarter for catching up on and organizing your grading and grades? Think about what that would do for your mental health and stress. But seriously, can we zoom out for a second on that? We're learning more and more that mental health is not just mental … IT IS physical health. 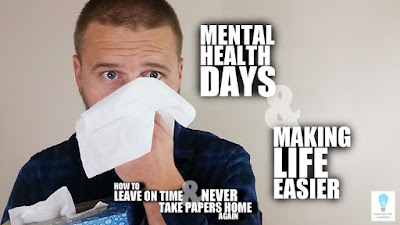 No longer do we have to smirk and crack a joke about “mental health days” or “mental sick days.” Mental health and sick = health and sick. So if we're stressed over how far behind we are, we aren't well. For reals! So don't feel bad about getting healthy and getting caught up. Invest 1-2 days a year into preventative health. Relax. Explore. Adventure. Connect. Go to the beach, mountains, mall, lake, amusement park. If you have personal days too, combine them together next to a 4-day weekend and take a trip. We took a whole week off at the end of Christmas and went to China for 2 weeks. Sure, I had to talk with my principal, make sure it was a good time of year, assure them I had great lesson plans and a solid sub, but then they were fine with it and I came back rejuvenated instead of exhausted. And sure, you've gotta really make sure those bases are covered so they'll say yes again next time, but don't be afraid to stand up for your health and use those days. Develop purposeful, helpful activities that fit into your standards and can be executed by any substitute teacher. Then you don't have to feel bad or fearful that your absence will be wasted. Purchase some useful lesson plans and resources that would fit those spots in your curriculum. Websites like www.TeachersPayTeachers.com can be super helpful for this. Hopefully this helps take you further into the conversation of how to keep yourselves healthy and peaceful in the long term. Now go take some practical steps toward using your Pre-Sick Days, so you can work toward health and balance. Hop on over to watch the video and share your thoughts in the conversation. 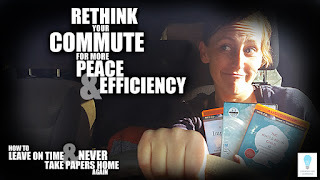 Today, we’re back with our series How to Leave on Time and NEVER Take Papers Home Again going to get real practical about using our commute time to make our day more peaceful and efficient. I know mornings can feel rough. Many days, our hugest success feels like simply leaving the house with all our clothes on. But once we're in the car, we’ve got a chunk of time to do something with. Let’s talk about how to use that time to really make an impact on the rest of our day. You gotta get to work somehow: car, train, subway, bus, bike, walk, carpool. You have some amount of time it takes to commute. Don't underestimate the value of this time. And don't think it's not enough time to really make an impact. It can be huge. 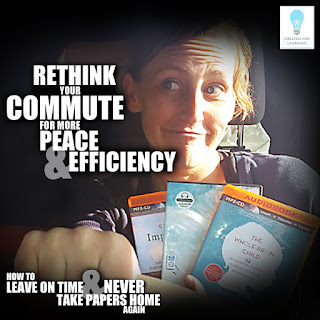 Instead of just vegging out or letting that time happen to us, let's talk about ways to repurpose our commutes for peace and efficiency. Everyone is going to use this time. But now you're going to repurpose it to make a difference. Your 1st step might be to use your next drive to brainstorm ideas that you could use your drive for. Get them all out. Then next drive come up with a plan. Put it in order, then hold loosely to it. Write it on a notecard and keep it visible in your car, so you see it every drive. Be interruptible for life, of course, but now that you have a plan, you’ll know what to do next each day. Then put it into plan and get started reclaiming this time to have more peace and efficiency. Conversation of the Day: What is something you could do during your drive to work that could make your day more peaceful or efficient? Exclusive FREE Universal Book Report Teaching Resource Take your literature instruction to the next level. Sign up to receive email conversations and resources that will help make your life at school smoother so you can have more of a life not at school! Visit Created For Learning's profile on Pinterest.